Badger Bridge : Adams & Smith, Inc. The Badger bridge in the port of Los Angeles was originally constructed in 1924 and served as the only rail road link to Terminal Island. Adams & Smith was contracted in 1996 to replace the bridge and furnished and erected the steel for it. The neighboring bridge is the Heim Bridge and handles vehicular traffic. 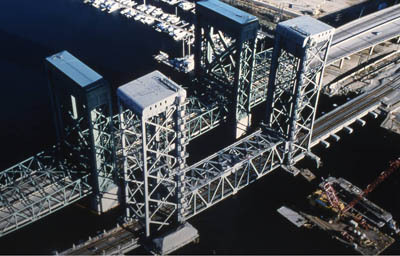 The two bridges run parallel to each other, crossing the Cerritos Channel to the ports of Los Angeles and Long Beach. More Information about these two historic bridges can be found at The Port of Los Angeles, or at this Virtual History Tour.